This is the best instruction I’ve found online for LgDTVUpdater, all the other instructions I came across online were missing steps.. I follow these instructions steps for Lg 55EA9800 and it worked perfectly. The only thing you need outside of the LgDTVUpdater down load is a copy of the older firmware you want to roll your TV back to. LgDTVUpdater + old Firmware + these instructions = SUCCESS!!!!!! General, I like these 6zi3u.gq http://6zi3u.gq/. As light as the color is I can see it staining really easily though. I am not a native english speaker. Please forgive me for grammatical errors. Have a 42LM640S with followed Problem: The SETTINGS will not works and if i push the HOME Button or MY APPS Button or INPUT: with all Buttons will show on TV only on right Corner below a red circle with message : loading. But nothing will happen. The TV has got the Firmware 4.62.12. 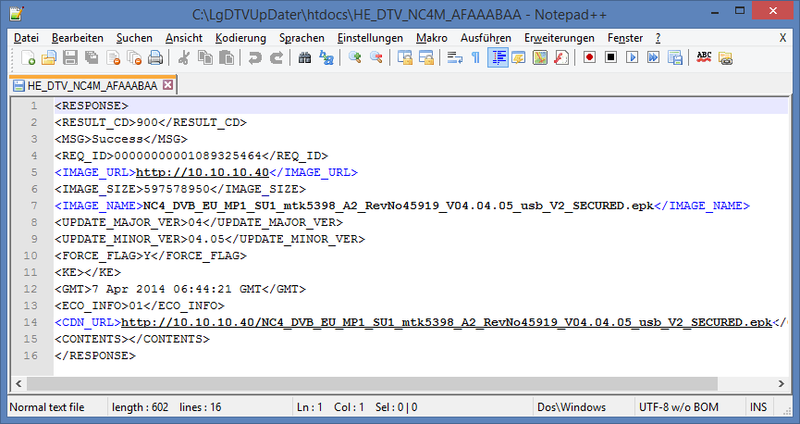 The old Firmware from LG Homepage 4.40.19 will be denied. There ist also no chance to start the systemmenu like SETTINGS to try to reset or other. My only way to update or downgrade will works with USB or network. I can watch TV without errors, but all other functions are gone. NOW my Question: how can i downgrade under this Circumstances my lovely TV? How can i fix it? I hope for answer and that you understand me :-) . The LG support cant help me. I checked your tutorial and everything looks good until point 9. Maybe do you have a solution for me? I own a 42lm640s with firmware 04.62.10 that I would like to return to version 03.03.50.
but I can not complete the connection: after manually entering DNS 192.168.1.7 and selecting automatic mode for IP, I try to connect but the message “no wireless network connection” appears. or address 0.0.0.0 and port 53 failed. Is there another DNS server / proxy running? Help please Which firmware do I need (and where to find it) to downgrade my LG 55LM860V in order to get back SKYPE and YOUTUBE apps. Many thanks! I ran through step by step and it’s obviously connecting to my computer but not getting the downgrade. Might be too new? OLED55B7P Version 04.70.36 trying to get Version 04.70.30.
hi. i have receantly bought tv 42LA6208, but someone or somehow falshed firmware inside is 47LN6138 and that tv dont have 3d option , and me too dont dahve that option because of the wrong firmware. Can you please someone help me to revert back original firmware , i have tried via lgdtuupdater and magage to lower version but it only lower version of firmer, but model of tv stayed same 47LN6138. Please help. I have a lg 55lw5600 and I’m looking to update firmware, LG website no self help, tv shows up but can not save to my laptop, dongle does not work anymore. Anyone have thoughts on this issue. Hope that you will understand me. Since the Firmware update for my lg 42lm640s (04.62.12) my amazon video app doesnt work. now i have saw that many people have /had the same problem. Today i tried to downgrad the firmware. But it didn´t worked for me. Connected the Pc to the TV with a lan cable. But the TV didn´t check the last option (ethernet). TV, Gateway and DNS checked but the last not. What problem could it be? Or had LG fixed it and you can´t downgrade with the newest firmware? LG might have fixed it but given the approach that’s being used with the method described here, I’m not entirely sure that’s possible. That said, I did my downgrade some time ago and have not bothered with it since. Maybe you can find some more help on an (unofficial) LG forum or pay for the service from the Russian hackers that came up with this method. They’ve posted a comment here in this thread somewhere. But now i´m searching for a other firmware (epk). Because the firmwares i have tried didn´t solve the problem. Do you know a overview site for the LG epk firmwares? No, I don’t; like I said I haven’t been following up on this for quite a while (and I certainly won’t be buying an LG TV when I’m upgrading my hardware in the future). But in case you find some, feel free to post them here. I can’t find any old firmware for my 55LM7600 , can somebody point me to an older version of this firmware. My tv auto updated and I lost all the icons from the smart menus, inputs. Tried factory defaults and that didn’t help. I just want to downgrade to the previous version to see if that fix the issue. Looking for firmware for my LG 55LA6205 TV. Have searched through google, forums, etc. Tried to reverse engineer download URL with no luck.